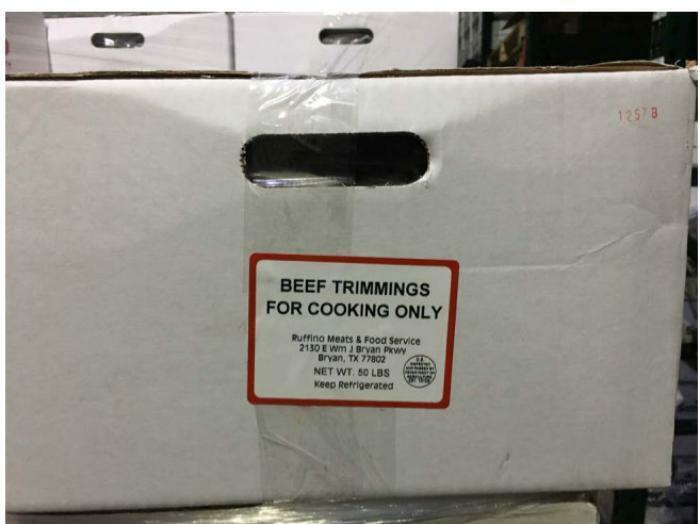 Readfield Meats, doing business as Ruffino Meats & Food Service, of Bryan, Texas, is recalling approximately 45,985 pounds of beef trimmings due to possible adulteration. Because they were distributed to non-federally inspected establishments, it cannot be verified that sufficient further processing occurred to remove foodborne pathogens that could have been present. The recalled products, bearing establishment number “EST. 13126” inside the USDA mark of inspection, were shipped to retail markets, state inspected plants, and individuals in Texas. Customers who purchased the recalled should not consume them, but throw them away or returned them to the place of purchase. Consumers with questions about the recall may contact Terry Wiese, plant manager, at (979) 776-5685.